Often we need to download a YouTube video/podcast as audio files to listen on later, play on cheap mp3 players and just to save them. You can't do that simply, as YouTube doesn't have any such downloading feature. So you're stuck with a browser add on, desktop application or a online downloader services. Both the browser addon and desktop application first needs to be installed on the system. On the other hand, you don't need to install anything to use the online YouTube to MP3 downloader service. YouTubNow is such an online YouTube downloader service among many others. Today we'll take a look to find out what's good and what not. Let's see what options are available with this online downloader service. Free and unlimited downloads- Of course this service is free and you can download as many videos/audio as you want. No registration- You don't need to put your e-mail address and register to use it. Multiple formats- There's a selection of audio/video formats you can download, MP4, MP3, Webm and M4A. Maximum video quality available for download is up to 720p. While downloading, you can select the preferred format to save. Search feature- No longer remember the exact youtube URL? No problem, just search the video by it's name. Well, there's two minor glitch I've found so far. First currently it doesn't support downloading 4K video. Anyway it's not a video downloader, rather a Youtube to mp3 downloader, so that's not a big deal. Second, the search feature isn't exactly very helpful, sometime it works just fine, sometime not. The process to download audio/video with YouTubNow is dead simple and straight forward. First you need to copy the YouTube URL form the browser tab. 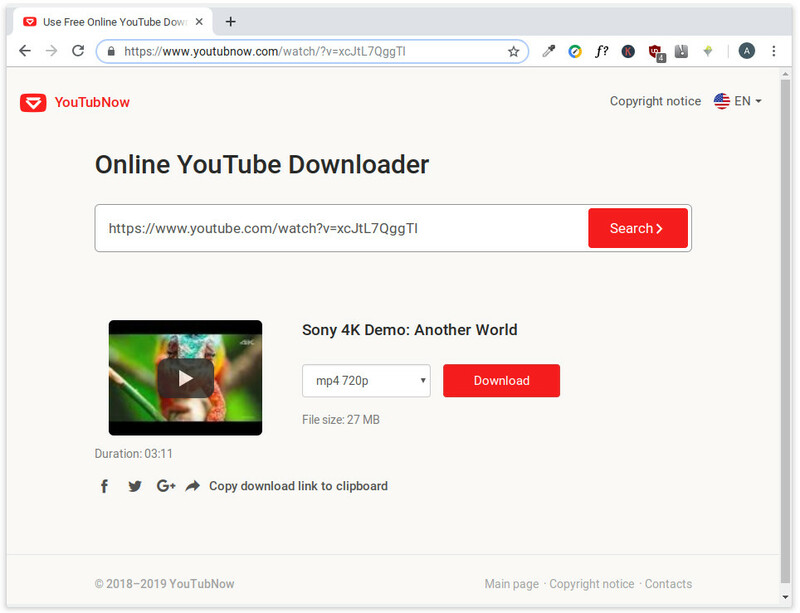 Next open up the the YouTube downloader URL on another tab or window. Then paste the URL on the input box, like below. Within few seconds, the Video thumbnail will appear with the downloading option. 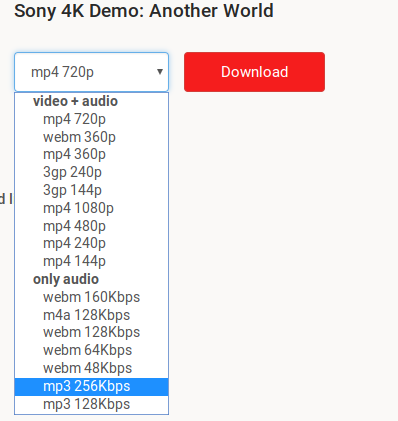 Select the desired format you want to download and just hit the download button. The download should start very soon. Another interesting option, you can actually download large videos faster by simply replacing the URL youtube.com with youtubnow.com . So is this service good? I'd say absolutely, and no doubt much better than using any untrustworthy browser addon, which have direct control over the web page you're visiting. As this online service doesn't require any kind of registration to use, so there's almost no chance of collecting any personal data, expect some anonymous usage data. You don't need to use such services if you're a computer geek, any tool like youtube-dl will suffice. However this downloader is absolutely no brainer, perfect for not so tech savvy people.